I recently worked with a delightful lass who lives in Paris, but is technically a Brit. So she’s got it all going for her, basically. 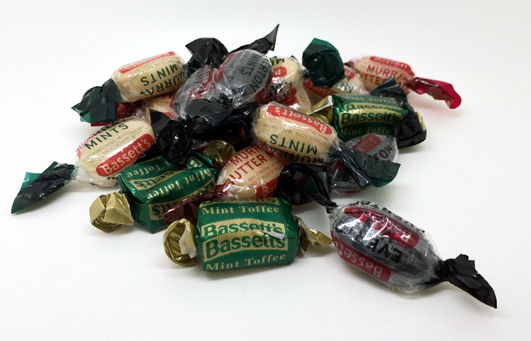 After talking candy, she decided that she needed to get me some old school British sweets I hadn’t tried yet. 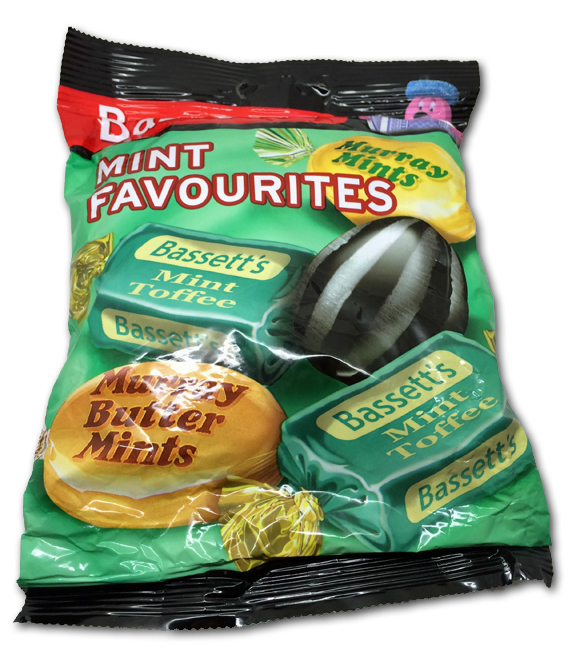 Among the things she sent was this bag of mint flavored candies from Bassett’s. Being completely honest, I wasn’t expecting too much, or even looking forward to trying the candies inside all that much. Mint is mint, right? My kid though, Jonny Guru Jr., is a mint freak. He can’t get enough. So after taking these photos, I gave the bag to him and didn’t think much of it. After I saw him eating a few pieces, I asked what he thought. “Great”, he said, while not really paying attention to me, watching “The Redonkulous Race” on tv. Still though, I’m daft, and didn’t think much of it. Jr. likes EVERYTHING more or less, let’s be honest. But then came the night I got home late and wanted a quick sweet. Hell, I had to review this stuff so I needed to try them right? Mint Toffee: holy, minty, crap! Forget what you think these taste like-because I’m betting you’re wrong. What they are is a classic caramel/toffee taste, very dense and chewy. And around the edges of the flavor, a hint of mint creeps in that somehow accentuates the caramel flavors and leaves you wanting even more mint. I ate all the rest of these in his bag. Murray Mints: these are just a mint hard candy, but not just a mint hard candy. There’s a fullness to this mint flavor that I don’t usually taste here in the states. You don’t just get a sharp mint tone, you get other elements of the candy flavor including some rounder flavor so that I can’t quite put my finger on, something…smoother. Murray Butter Mints: holy freakin’ crap. These are AMAZING. Take everything great about the Murray mint, but now add a creamy buttery side to it. Also, as if that wasn’t enough, the center is slightly chewy which just rocks my boat. Have you ever had pillow mints? There’s a creamy taste and feel to them. These only have the taste, but done way better than pillow mints. My Brit friend had told me these were her favorites, and I get it now. These are delicious. I ate all the rest in his bag. The last variety is the dark colored one, called an Everton Mint. These were my least favorite. Very strong, with a slight menthol edge, these are kind of what I expected everything in the bag to taste like. They’re not bad at all-but I wouldn’t seek these out, as I feel like they echo what a lot of other mints offer and aren’t super delicious. Theres a moral to this story: stop giving all my candy to my kid because apparently, he’s vying for my job and has a slightly more advanced palette than I do. It’s hard to explain exactly how I feel, but it’s somewhere between pride at my excellent job of raising the Jr., and pure, unbridled paranoid fear. Let’s just say I’m watching my back. Last piece of great news about this candy-you can get them over here quite easily. Check them out with the link below, and let us know which of the four varieties in the bag is YOUR favorite.